I saw someone two Saturday's ago in long sleeves. It was easily in the 90s. My only logical explanation was he was training for Badwater. 85 degrees - was that first thing in the morning?? That's the current temps here. I woke up the other morning and the TV said 88!! Craziness. Maybe that guy has a sun allergy, but that sounds miserable. Some fabrics are made to keep you cool during high temps - I have some arm sleeves that literally make my arms feel air conditioned! Crazy cool. There is a girl in my neighborhood who is always out running all bundled up like it's winter. Long sleeves and running tights in 80 degree weather. I just don't get it. I like to do a Three Things Thursday from time to time and also a Throwback Thursday like I did today. Some people still believe they lose weight by sweating it off. Keep posting the photos. You're doing a great job!! 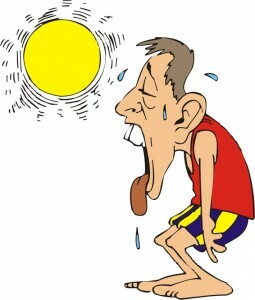 I saw a guy running with a sweatshirt & long pants the other day and it was in the 80's hot & humid!!! Crazy! You take far better pictures than me... but I only run with a cell phone, maybe if the Cape Town weather ever improves I pack my camera in my pack!!! You have a great landscape for pictures coach.